In grade school we were encouraged to wear our Halloween costumes to class. One year I went as a book wich basically meant I had my head and arms sticking out of holes cut into a tall, shallow box. (The bottom was open for my legs,) This box was suddenly very claustrophobic the first time I had to pee. The real Iron Man doesn’t need a monkey wrench to… do something else. 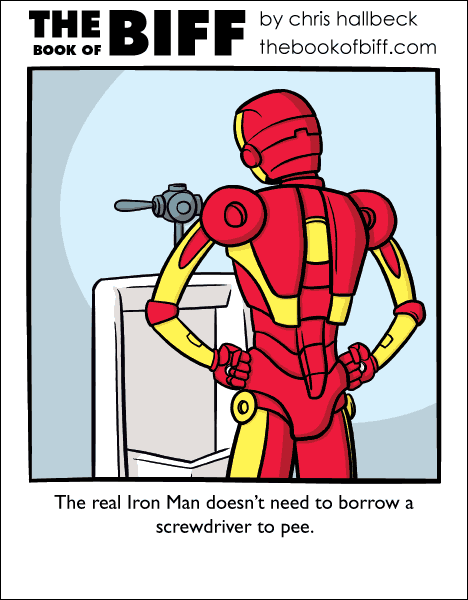 Superhero or not, sometimes a man just has to glare at a urinal like there’s no tomorrow. wait, I think I just ruined the joke. This Comic makes me think of the Movie “Star Kid” he really did need a screwdriver.